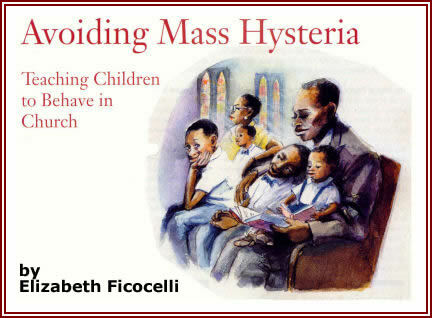 My husband and I are frequently approached after Mass by people who feel compelled to tell us how good our children were in church that day. How do we do it, they want to know – with four young boys no less? “Some days are better than others,” I respond with a grin. Which is true. Some Sunday mornings are relatively uneventful, while others can be pretty darn trying. But, for the most part, our boys (ages ten, six, three and one-and-a-half) have learned appropriate church behavior without the use of snacks, sippy cups, crayons, books, routine trips to the potty and, usually, without much fuss. Sound impossible? It’s not, really. As with any other parenting skill, it takes love, time, consistency and lots of patience. (A few prayers never hurt, either!) The following tips may help make your experience of taking little ones to church change from holy terror to just plain holy. Catholics are notorious for arriving at church just in time or, worse yet, slightly late. Few of us make the effort these days to prepare for what we are about to celebrate at Mass. When you have children, this preparation time is even more critical, yet all the more elusive. Our family’s church experience, therefore, begins long before we ever set foot inside the door. We use time at home, perhaps over dinner or breakfast, to discuss proper church behavior. We review church etiquette: when to sit, stand or kneel. How to give the sign of peace. Why it is important to sing and pray with the church community. What the creed means. We discuss our family rules of conduct and why they may differ from those around us. A fundamental rule in our family is absolutely no food or toys in church. This is the way it has always been, so our children expect nothing different. While we can control what we ourselves bring into the building, however, we have no say in what other families do. This is something most people seem not to think about when packing their picnic baskets-activity bags for church. While their intention is good (to keep their children quiet so they don’t bother others), the fact is that bringing food, toys and other items from home can be highly distracting to neighboring people, especially the young ones. In moments like these, we do our best to ignore the zipping and unzipping, the crinkling of candy wrappers and the dropping of toys and try to regain our children’s focus (and ours) on Mass instead. Three-quarters-of-an-hour can also be survived without books or toys to occupy a child’s mind. Church itself should occupy his mind! I’ve been amazed and disappointed to hear toy cars whirring or hand-held electronic games beeping during the liturgy. Once I even saw a small boy walk into Mass with a full-sized basketball under his arm. What are we telling our children with this kind of permissive behavior? Certainly not that God deserves our undivided attention for less than one hour a week. Think of the time and energy you can save by not having to pack those snacks and finding that favorite teddy bear before rushing out the door to make Mass. You can use this valuable time and energy on preparation instead. As soon as our oldest son became a proficient reader, we had him begin reading the day’s scriptures during the drive to church. Currently, our 10- and 6-year-olds share this responsibility. Time permitting, we discuss what we’ve read and ask the children questions to test their understanding. The two younger ones have learned not to interrupt this time, but to listen quietly from their car seats. Since our 3-year-old chimes in from time to time, we know he’s grasping some of it. This scripture review is particularly beneficial for my husband and me, so we are not hearing the readings for the first time in Mass when the possibility for distraction exists. Before our family enters church, our 3-year-old, who is potty training, can have one more opportunity to use the facilities. The older ones have been encouraged to go at home. It is extremely rare for any of our children to leave Mass to use the bathroom. Unless it is a real emergency, we ask them to wait until Mass is over. Again, 45 minutes is not that long, and permitting children to go during this time can develop into an undesirable habit.